Disrupt SF 2014, an event where new technology startups showed their products to the public and to prominent investors, took place last week in San Francisco. Launched by the web magazine TechCrunch in 2011, it has just reached its 10th edition and will hit Europe next October, when another conference will be hosted in London. An app named Alfred prevailed upon the 26 most “promising, under-the-radar companies” on the Startup Battlefield and won the $50,000 prize. 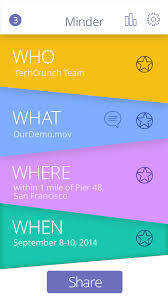 Afterwards TechCrunch disclosed that CrunchFund invested in Alfred, but its founder Michael Arrington, was not involved in the judging process. Minder was not listed among those 26. It appeared at Startup Alley, a spot where hundreds of early stage companies showed off their technology as well as their talent. This app, still in its beta program, is the first released by Storycloud, a provider of cloud-based operating systems for user content control started by Ken Kalb. How does it work? You select contacts from a device, or import them from Facebook or Google, and through Minder you control your digital lives. What Storycloud aims at is creating an “unlimited private social network”, managing who will see your contents, what kind of contents will be published, and where and when they will be accessible. Basically, you share a link via email, SMS or Facebook, and this link takes your contacts to your contents inside the app. Moreover, Minder provides analytics, overlapping some functions already available on Facebook pages. Kalb and his team are ambitious: essentially they want you to control your contents after you shared them on the social networks. A screenshot of Minder interface. Source: Minder. The issue of content ownership may appear inconsistent with the controversial Facebook terms of service. However, a project such as Minder could eventually pressure the company headquartered in Menlo Park to readdress its policy. But what appears crystal clear it is how useful Minder could be for content creators like marketers, artists and writers: Minder concerns copyright, and hence business. As TechCrunch journalist Ron Miller explained in his article, “the company is funded by private investors” that Michael Tracy – vice president of business development at StoryCloud – “didn’t wish to name”and it “will probably charge content owners to use the service”. 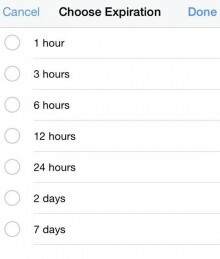 The new Facebook feature that allows to schedule deletion of posts. Source: The Next Web. On the other hand, apps like Littrr and DeleteitLater allow any user to create self-destructing statuses, pictures and tweets. 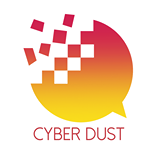 Cyber Dust logo. Source: Cyber Dust. If the ‘closed’ internet (Zittrain, 2008), monopolized by corporate players, has been accused of placing control of third-party developers who were “not in accordance with the strategic aims of the platform providers” (Puschmann and Burgess, 2013), now it has to deal with end-users who have become conscious and worried about their digital life. To emphasize the importance of Minder, Miller stated that Chris Anderson’s Long Tail theory could not be applicable anymore, since products will not be on the internet forever without any form of control by the end-users. Though he did not mention how that theory has been critized (Elberse, 2008) and how professional content creators could profit by limiting the visibility of their products. Neither he said that even if Minder is used to control your content, Facebook determines its ownership through its terms of service. Since Facebook and Twitter have been used as business features, the question is not limited to how social networking platforms use your data, it concerns also the accessibility and traceability of copyrighted content by the users. This could eventually lead to a new business model shaped around the new end-users’ needs, redefining the corporate view of “data as a valuable commodity that […] needs to be protected through intellectual property regimes […] and […] be exploitable for capital gain” (Kitchin and Lauriault, 2014). Anderson, Chris. The Long Tail: Why the Future of Business is Selling Less of More. New York: Hyperion, 2006. Jean Burgess, Merja Mahrt and Cornelius Puschmann. New York: Peter Lang, 2014. 45. Elberse, Anita. “Should we invest in the Long Tail?” Harvard Business Review (July-August 2008): 9. Kitchin, Rob and Lauriault, Tracey P. “Towards critical data studies: Charting and unpacking data assemblages and their work”. The Programmable City Working Paper 2. (29 July 2014). Pre-print version of chapter to be published in “Geoweb and Big Data”. Eds. Eckert, J., Shears, A. and Thatcher, J. University of Nebraska Press. Is it time to change college?